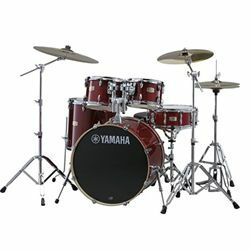 In 1995, Yamaha rocked the world with the Stage Custom drum set. Now, reimagined with 100% birch shells and higher quality metal parts, they’ve set the standard for value and sound, again. This kit also features the incredible Yamaha Enhanced Sustain System (Y.E.S.S.) which ensures minimal contact between the hardware and the shells. When combined with the ball mount and clamps for the rack toms, this drum set is one of the most versatile on the market.